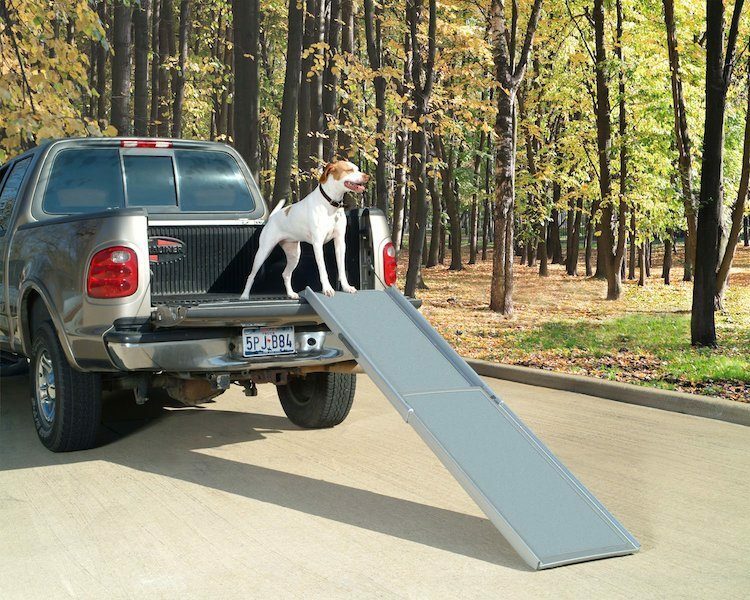 A dog ramp for a car can help senior pets and those with mobility issues get in and out of your vehicle. 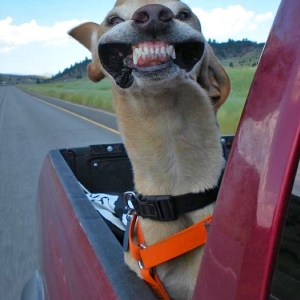 Here’s our list of the 4 best dog ramps for cars. As dogs age, they’re susceptible to a number of infirmities, some of which affect mobility. 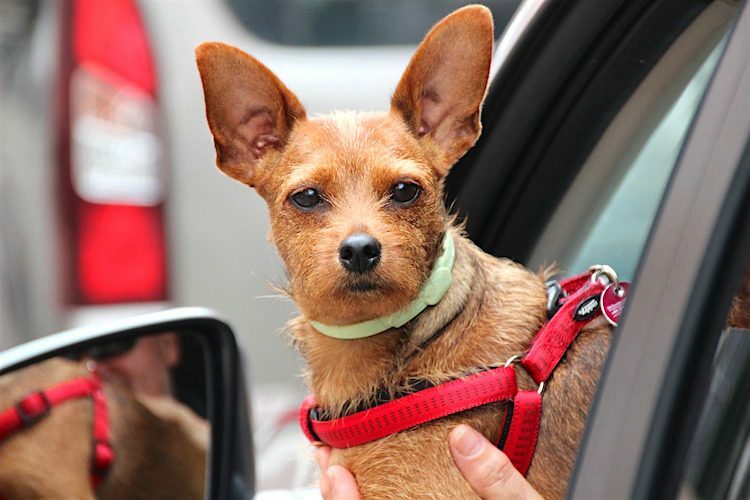 A once-agile dog who could leap into the back of a car with no difficulty now struggles just to make it down the front steps. There are several things you can do around the home to help your dog adjust — higher food bowls, gates preventing access to stairs, etc. — but your pet does have to leave the house and get into a car every once in a while, and that can be a challenge. Some people simply don’t have the strength to lift their dog in and out of a vehicle, or they have a dog who doesn’t like being lifted. 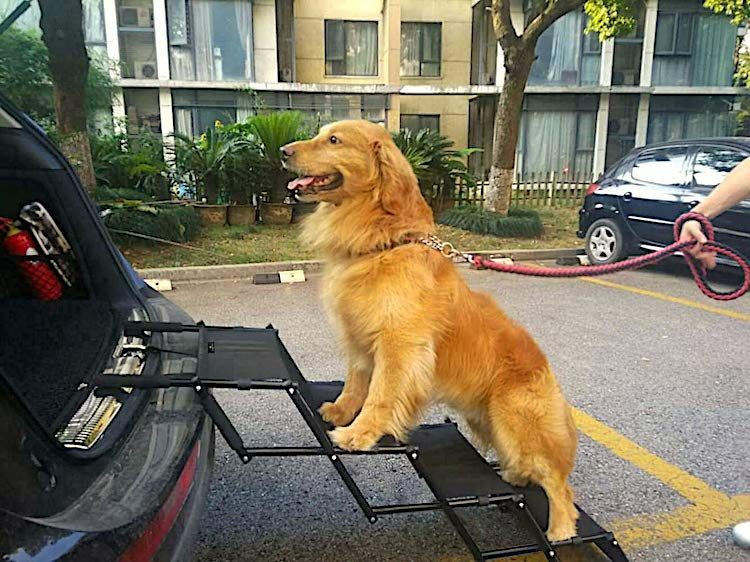 A dog ramp for a car can be the perfect solution, allowing your dog to get safely in and out of the car without putting undue strain on their legs or hindquarters. Is a Ramp or Stairs Better for Dogs? If your pet seems to be able to navigate regular stairs, then steps designed for pets may be a good option. When your dog jumps down from furniture, they’re taking the brunt of the impact on their joints. Over time, this can contribute to degenerative diseases such as arthritis or myasthenia gravis. Using steps in your home keeps your dog from taking that jolting impact with every jump. And with smaller-breed dogs, steps can help prevent injuries from jumping off of high surfaces such as beds. Many people have several sets of steps in their home. They place the steps in front of couches and beds so their pet can safely get up and down. 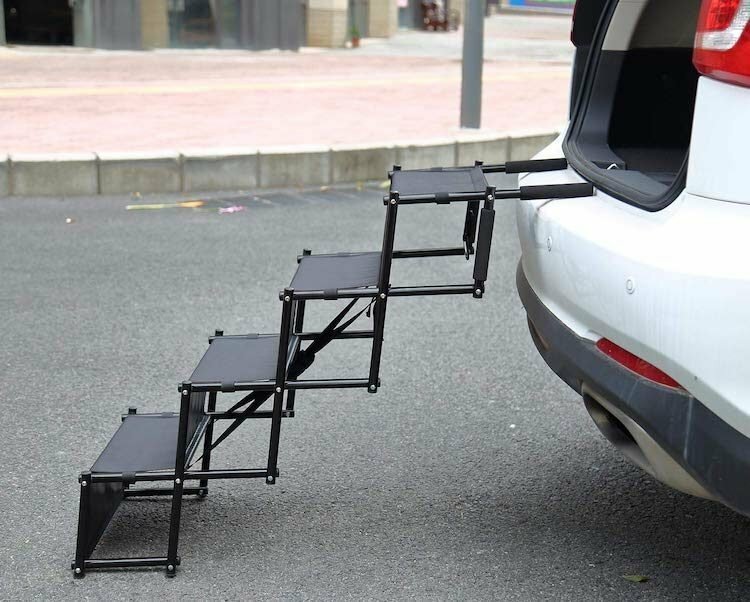 Steps have the benefit of being lightweight and portable, and they’re usually small enough to fit easily inside a car if you need to take them with you. 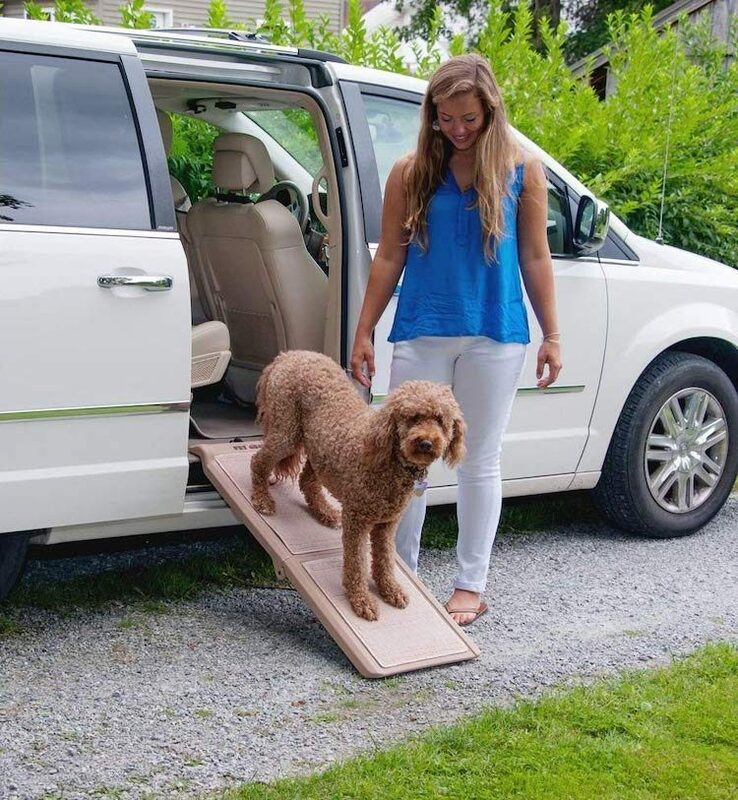 If your dog is a senior or is already struggling with mobility issues, then it’s time to consider getting a dog ramp for a car. That’s what we’ll discuss in detail below. What’s the dog ramp made of? Will it be sturdy enough for your dog? Is it easy to disinfect? The ramp needs to safely bear your pet’s weight while being light enough for you to move it around. For sanitary reasons, the ramp should be washable. In addition, the surface should be a nonslip material to prevent injuries. “Or at least there should be horizontal slats across the dog ramp that the dog can use to help stabilize himself when he is walking up the ramp,” says Colleen Demling, dog behaviorist and certified professional dog trainer at Dogtopia. Is the dog ramp tall enough to reach the back of the car or truck? 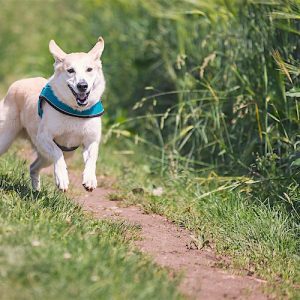 Is the slope appropriate for your pet’s infirmities? Does the length prevent storage, or does the ramp fold? A steeper ramp may prove challenging for some pets to walk up. Likewise, a too-long ramp that doesn’t fold up means you can’t take it with you — which defeats the purpose of having it. How steep should a dog ramp be? “The ideal incline for a ramp is about 18–20 degrees,” says Demling. How wide should a dog ramp be? The ramp must be wide enough to safely accommodate your pet — and tall enough to reach the seat in your vehicle. Is the dog ramp heavy enough to stay still while your pet moves up and down? Look for a ramp that’s solid enough to stay still while your dog uses it, but not so heavy that you can’t easily place it in or remove it from your car. What does your specific dog need? Is your dog already struggling with joint pain or other ailments? Pets with joint pain need a ramp with a gentler incline. Larger and heavier pets need a stronger ramp. How Do I Get My Dog Used to a Ramp? Some dogs don’t need much coaching to grasp the concept of climbing onto dog ramps. Other dogs may resist the idea, so you’ll have to provide patient training to help your dog adjust. So, how do you train a dog to use a ramp? As with all training, patience, persistence and positive reinforcement are key. Place the dog ramp flat on the ground and use a treat to entice your dog to walk across the ramp. Repeat several times. This step will get your dog used to the feel of the ramp under their feet. Use your hand to signal the dog to walk across the ramp. By now, your dog should be used to crossing the ramp, so have them cross without a treat or hand signal. Begin raising the ramp gradually. Do this over a period of time, allowing your dog to adjust to the new height and become comfortable going up and down the ramp before adjusting the height again. Again, some dogs will move through this training quickly while others will need more time. Go at your own dog’s pace and continue to make this a positive experience. 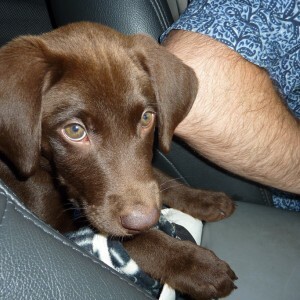 There are countless variables to consider when choosing the right dog ramp for a car or SUV. Rated for up to 300 pounds, this ramp is sturdy enough for any large-breed dog. It weighs only 18 pounds and folds up, so you can take it with you wherever you go. The extra-long feature means that the ramp extends out farther, making for a gentler incline and allowing the ramp to reach higher-profile vehicles like SUVs. Some reviewers tell us this ramp’s nonslip surface tore or did not work as well as they’d hoped. They had to attach a different type of material to the ramp, such as outdoor carpet or bath mats. Although it does fold, its size means it’s slightly bulky. Rated for up to 200 pounds, this dog ramp is surprisingly lightweight. It includes a handle for easier storage. Its Astroturf-like surface provides a sure grip for pets. Several models of this ramp are available, and some aren’t meant for high-profile vehicles. Some reviewers tell us the ramp should be wider and that their pets were nervous because of the narrow width. Check measurements carefully. This dog ramp is rated for up to 250 pounds. The surface is over 18 inches wide, which helps pets feel safer using the ramp. It also folds in half and has a carrying handle. Many reviewers have said that upon delivery they had to tighten some screws holding this dog ramp together. Once this was done, however, the ramp performed well. At 32 pounds, this ramp is heavier than others on the market. Some people may struggle with getting the ramp in and out of their vehicle. Some dogs may not accept a ramp no matter how persistent and positive their humans are. These stairs may be a good alternative for these pets. These stairs weigh only 9 pounds but are rated for dogs up to 100 pounds. They fold up like an accordion, making for easy storage and transport. They have an adjustable gradient, meaning that the height can be adjusted for use in a vehicle and inside the home for furniture. Larger dogs may struggle with the narrowness of the design. Lastly, if you’re handy, you always have the option of building a custom dog ramp for a car. Take your dog’s weight and size into account, as well as the height the ramp needs to reach while still allowing for a gentle incline. Make sure it has a nonslip surface and grips to allow the ramp to rest firmly on the ground, especially while in use. 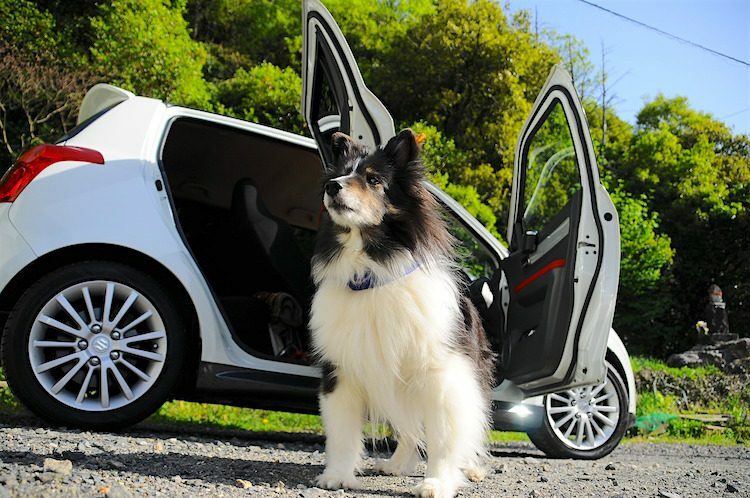 With any dog ramp for a car, be sure to supervise your pet to prevent injury. Some ramps have straps to attach them to vehicles while others don’t. Either way, it’s best practice to supervise. Reisen, Jan. “Does Your Dog Need Dog Stairs or a Ramp?” American Kennel Club. Nov. 29, 2016. https://www.akc.org/expert-advice/health/dog-stairs-and-ramps/. Ichir, Lazhar. 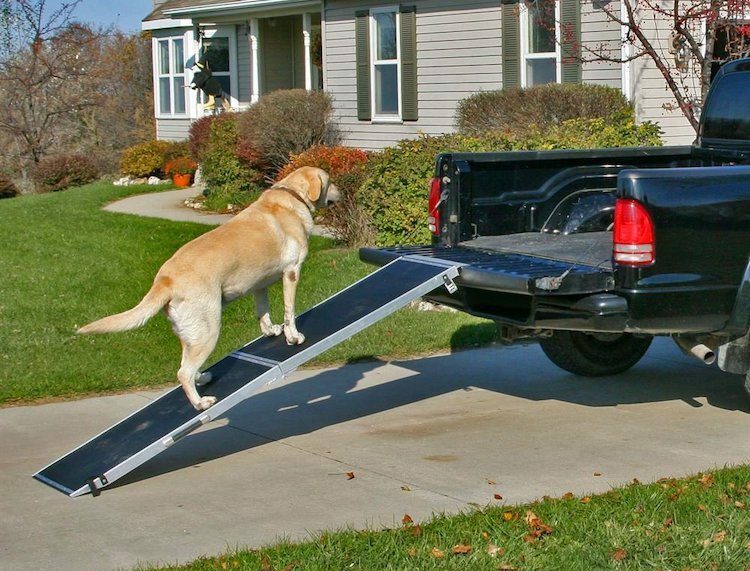 “5 Best Dog Ramps — Folding, Telescoping and More.” Breeding Business. June 20, 2016. https://breedingbusiness.com/best-dog-ramps/. “Senior Pets.” American Veterinary Medical Association. https://www.avma.org/public/PetCare/Pages/Senior-Pets.aspx.